We have been the Dutch slide bearing specialist since 1948. We love craftsmanship, top quality and enthusiastic customers. Ever since its establishment in 1948 Engineering Bootsman has been a family business. Starting, as it should be, in a small shed in Zaandam, Engineering Bootsman developed into the leading slide bearings specialist of the Netherlands. That may a sound a tad cocky, but every day we make the difference in quality, speed, delivery, reliability and anticipating customer demand. At the end of the day, it’s about solving any problem a customer may face and that often means much more than simply adopting a “you name it, we’ve got it” method. 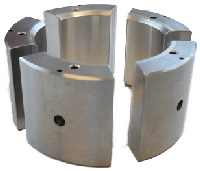 Radial/axial slide bearings, thrust pads, tilt pads, 4-point slide bearings, crank pin metal, lemon-shaped bearings or off-set bearings. Whatever your requirement.